Paper Mate Felt Tip Pens 20-Count Just $7.18! Down From $30! 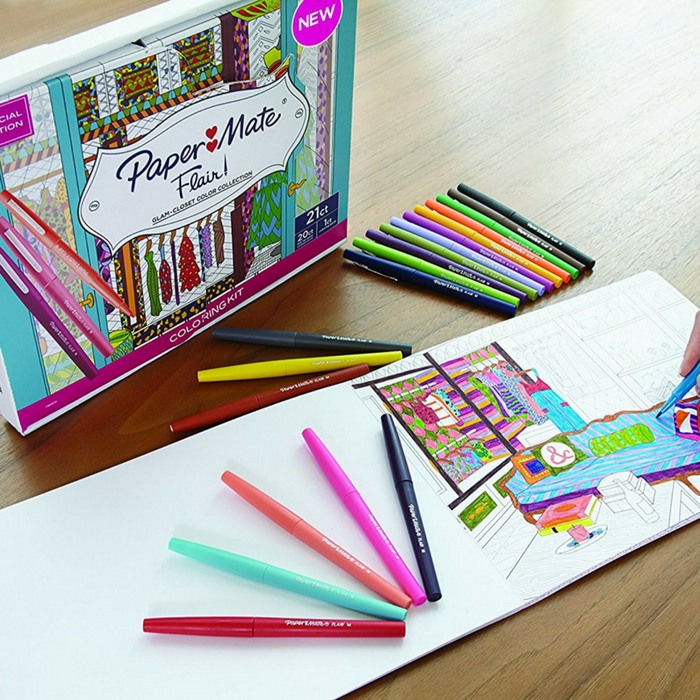 You are here: Home / Great Deals / Amazon Deals / Paper Mate Felt Tip Pens 20-Count Just $7.18! Down From $30! Amazon has this Paper Mate Felt Tip Pens 20-Count for just $7.18 down from $29.99! Please note that this is an add-on item and will ship with a qualifying order of $25! Express your stylish side in trend-setting color with the Paper Mate Flair Women’s Closet Adult Coloring Book Kit. The adult coloring page set is filled with 20 fashionable shades that were selected to help you fill your dream closet with glamorous color. The adult coloring markers feature Point Guard to prevent fraying, a medium point that boldly draws details and beautiful acid-free, no-bleed ink that dries quickly. Designed by professional artists and made from thick, premium paper with perforated edges, the adult coloring pages are easy to share and showcase! Range of shades selected to bring color to your closet – design a dream wardrobe with shoes, shirts and skirts in all your favorite shades! Click here for more Amazon Deals! The price(s) listed here was the current price(s) at the time this post went live. Prices at Amazon change quickly. So, always know that when you go to Amazon, you will need to check the price before you purchase. Sign up for here for —>Amazon Prime FREE for 30 days! You’ll get unlimited FREE 2-Day Shipping, FREE kindle books, streaming movies, and access to Amazon Mom for an extra 20% off diapers! Sign up here for —> Amazon Mom, Along with your 20% off diaper subscription you’ll also receive exclusive coupons, too! Sign up here for —> Amazon Student (if you have a school email (.edu) address) and get a FREE 6-Month Trial PLUS 50% off of your own Amazon prime membership after your trial if you choose to keep it!